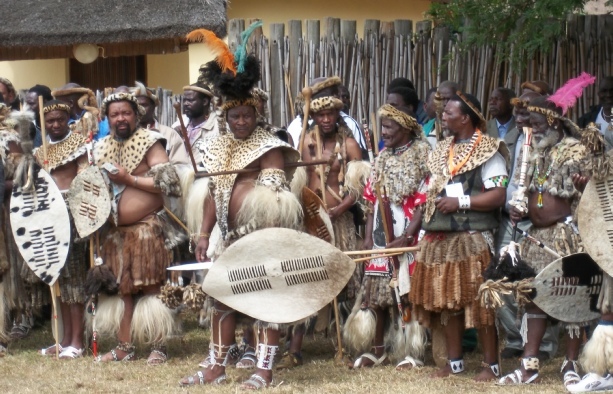 The Zulu King’s Reed Dance (uMkhosi woMhlanga), took place on the 9th of September 2017 at the eNyokeni Palace (watch the video at the bottom of the page). Zululand Eco-Adventures does a fully guided tour of this amazing celebration, email info@eshowe.com or enquire here. The tour to the Zulu Reed Dance leaves from Sugar Hill Manor and Zululand Backpackers in Eshowe at 8.00 am on the day of the Reed Dance, and returns before 7.00 pm, or when there is a consensus amongst the visitors. If you take your own vehicle it gives you the flexibility to leave when you’re ready. 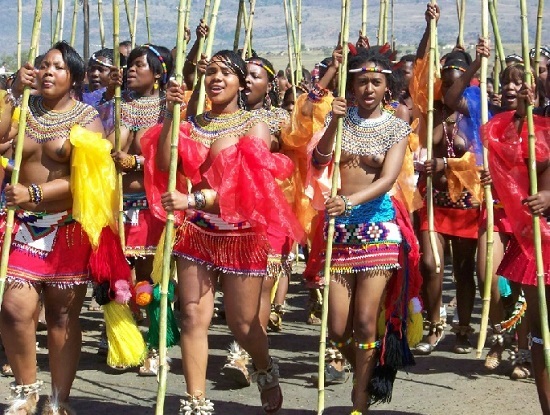 More than 25 000 Zulu virgins gather at the King’s Enyokeni Traditional Residence for this very colourful and meaningful ceremony every September which promotes respect for young women, and preserves the custom of keeping girls as virgins until marriage. In the olden days, the women gathered at the Zulu Reed Ceremony (Umkhosi woMhlanga) and men at the First Fruits Ceremony (Umkhosi wokweshwama). 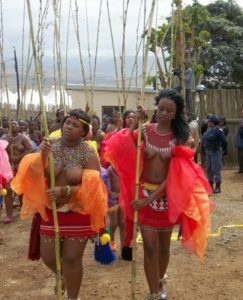 The Zulu Reed dance is an educational experience and opportunity for young maidens to learn how to behave before the Zulu King . This is done whilst delivering reed sticks, singing and dancing. Maidens learn and understand the songs while the young princesses lead the virgins. The maidens wear ‘izigege’ and ‘izinculuba’ that show their bottoms. 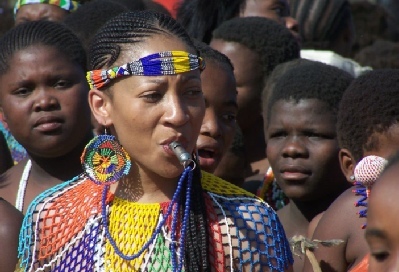 Traditional attire includes beadwork to symbolise African beauty at its best. At this stage the maidens are taught by senior females how to behave themselves and be proud of their virginity and naked bodies. That allows maidens to expect respect from their suitors who intend approaching them during the ceremony. The second phase is educating the young maidens ‘amatshitshi’ by their older sisters ‘amaqhikiza’ on how to behave in married life. Young maidens are encouraged not to argue or respond immediately but to wish the suitor well on his journey back. After protracted discussions the older sisters then approach the mother of the impressed maiden about the impending love relationship. If the father accepts the suitor the two families meet and gifts are exchanged as a sign of a cordial relationship. After this the young maiden ‘itshitshi’ takes the next step of being ‘iqhikiza’ – a lady in charge of the young maidens. By then they are experienced chief maidens who act as advisors to the younger maidens – and are ready for married life. The Zulu Reed Dance plays a significant part of Zulu heritage in reflecting diverse African customs. This ceremony is still close to the heart of many traditional leaders and citizens. It portrays and instills a sense of pride, belonging and identity among the youth. This ceremony has been tirelessly celebrated by countless generations in early September of each year. Thousands of maidens converge on King Zwelithini kaBhekizulu’s palace to dance to the delight of the King, loyal subjects and guests. Only virgins are permitted to take part in this ritual. Each maiden has to carry a reed from the river and present it to the King in a spectacular procession at the Enyokeni Palace. The girls converge in groups from the Zululand regions on the Kings Palace the day before the ceremony. The activity promotes purity among the virgin girls and respect for women. The Zulu Reed Dance ceremony is the key element of keeping young girls virgins until they are ready to get married. On the day of the ceremony the girls start walking to the main hut of the King’s palace. As the King appears to watch the procession of girls he is praised by his poets or praise singers (isimbongi). The girls collect a reed from a huge pile and proceed in a very long procession. They are led by the senior princess. As they pass the King they lay their reed down and head towards where the King delivers his speech. While this is happening the men sing their songs and engage in mock fighting. After the festivities the King delivers a speech. This speech is a very direct and forthright message on the expected mores and traditions of the Zulu nation. The King is very direct and nothing is left to the imagination. He is a great proponent of celibacy until marriage. Afterwards the maidens join in unison ululating and singing the Kings praises in a joyous mood. As a cultural gesture, the group of maidens then get a name from the King to distinguish themselves from other women. “On the dawn of this day I am always overjoyed, this caused by seeing all of our beautiful flowers (our children) and our culture. I would like to thank you for this opportunity to address and welcome ‘izintombi’ (young, virginal girls) who have come from far and wide to attend uMhlanga (Reed Dance) which shows that the dreams of our forefathers are still coming true and that our children want a brighter future. Thank you to all who have helped make this day possible. “Most of us know that this year the ceremony is a little different from past years, this is caused by the fact that we are celebrating 12 years since the re-introduction if this ceremony. “This ceremony was re-introduced in 1984 with a few ‘izintombi’, there were also ‘amabutho’ (young warriors). I have asked all those ‘izintombi’ and ‘amabutho’ who are now ‘omama’ (married women/mothers) and ‘obaba’ (married men/fathers) to be here. I had attended the Human Unity Conference where the focus was HIV/AIDS, this is what prompted me to bring back this ceremony that promoted and encouraged abstinence within our youth. In 1987, the KwaZulu government led by uMntwana kaPhindangene (Chief Mangosuthu Buthelezi) started supporting this ceremony financially to ensure that it could be attended and be well received by the whole nation. “I’d like to thank other countries who have supported this ceremony especially Swaziland who have been with us since the beginning. “I’d like to thank my daughters for the role they have played in the success of this ceremony. It must be noted that this ceremony is not only geared towards promoting virginity and abstinence amongst girls but also young men. The fusion of these ceremonies brings us hope for a better future. We see a nation that is vibrant, strong, has self respect and is respected. “We are in a time where when an ‘intombi’ and ‘insizwa’ (young man) want to marry, must go for a blood test to prevent any family disputes caused by mistrust. We are fighting against the high number of orphans, we know the Government and councils are constantly making us aware of ways to prevent the spread of this disease once one has it. This is why it is important to go for a test when you are involved in a relationship or are getting married. It is my wish that all educators promote the culture of the Zulus. “We all know that change is here and will always be, as a nation what is important to understand that change is good as long as it does not promote hatred from the past. “We need a good foundation to promote a brighter and better future. While some aspects of our lives have changed, as Africans, we should not distance ourselves from our culture and take on the cultures and traditions of other nations. “I’d like to thank all parents who have supported and encouraged their children to respect and observe the Reed Dance and for believing in me as their King. I’d like to encourage other parents to promote this vital and important ceremony which instils good values and morals within our youth especially in this day and age. “I’d like to thank all those that are now married with whom we started this ceremony, I’m sure there is great pride in a woman going into marriage untouched. Their presence is a great example to the young women here who are our future mother and leaders. “Without the young women present here today, this uMhlanga would not have been possible so I wish to thank you for giving of your time and for promoting what is so special to our nation. I encourage you to keep on doing so. We depend on you to be the future of this nation; because of you we have high hopes to stop the spread of this killer disease. We cannot forget all those who gave tirelessly and freely of their time to make this day a success despite difficult circumstances.